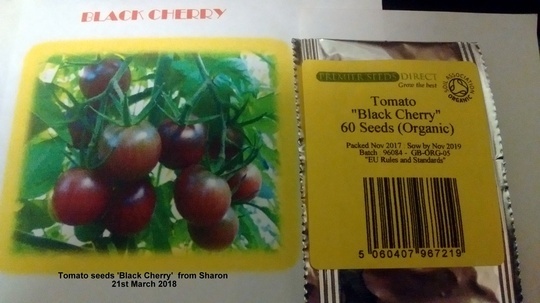 Father’s Day is always the same date every year whatever day of the week it happens to fall on:March 19th San Jose (St Joseph) so this year she gave me a card & envelope she had made herself but above all she gave me 5 packets of tomato seeds! In all there are over 400 seeds!!! Sheet of photos done by my daughter. Last year she gave me some tomato & Sweet Pepper seeds but far too late in the year to sow. So I kept them to sow in the spring of 2018. 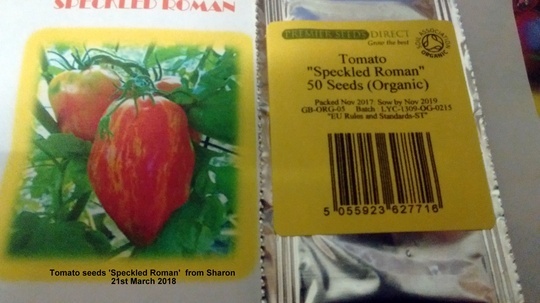 On March 20th I looked for the seeds but only found the Sweet Pepper ones, the tomato seeds (I think they were ’Gardener’s Delight’) were nowhere to be found. 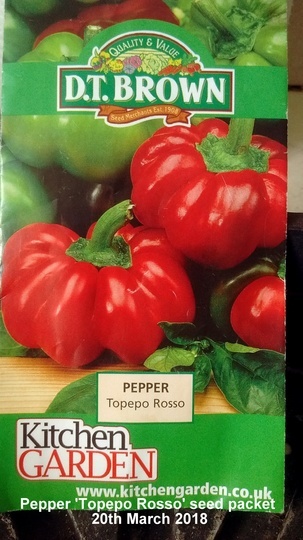 I didn’t realize till I went to sow them but the packet of Sweet Pepper seeds is from 2014! They were a freebie in a gardening magazine she bought. I suspect the tomato seeds were from then as well! I looked on the back of the packet & it said to sow by 2016! Nevertheless I sowed them on March 20th as the tiny envelope inside the packet was still sealed. If they germinate well I will have gained some Sweet Peppers I hadn’t planned on growing but if they don’t nothing’s really lost. 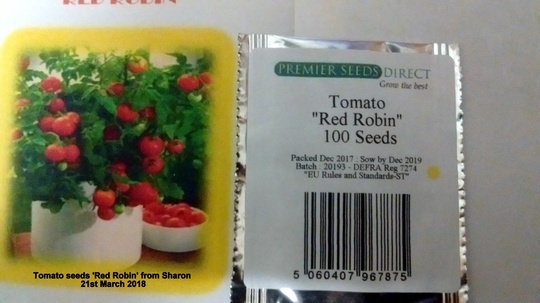 Anybody want a few seeds of ‘Alicante’ or ‘Red Robin’? Just send me a PM & I’ll send you some. I’m planning on growing a few plants of each to put on the balcony & a few more for my daughter to put in her back garden. I must ask my son who also lives here if he wants a few plants. I gave both of them 10 plants each last year & grew 10 on the balcony for us. I don't mind a few seeds Balcony. I have never bought a pack of them because most would waste. I haven't got room. However, I could try a few seeds and see how they go. I've never tried them before. I usually buy plants. Arthritis pain after eating fresh Tomatoes in salads 3 weeks ago. I have thrown my Golden Sunrise Tomato seed away I am so upset. There is no cure. Just exercises and keep moving. Told by a GP to take Paracetomol which I will not do as its addictive and weakening. already, and feel a lot better. We had masses of tomato plants growing on our compost heap! They did not survive the Winter but I am watching out for some Spring ones at the moment. Not sure if I can get my OH to cut out tomatoes from his diet, Diane. Won't cooking them help? Releases lycopene, which I have read can be very helpful, especially in some cancer cases. Thats interesting Eirlys. I used to cut them in half and put a sprinkle of Muscavado sugar on top. Makes a kind of glue in the frying pan ! exercising daily. Cleaning the flat more often helps . Bought more Turmeric today. The first jar of Acacia Honey is almost empty, never ate so much Honey before in my life. Also bought the fresh Ginger and Lemons to make the fruit drink with Turmeric in, as recommended. very well paid GP who came here and told me nothing. Wow. Looks like you have a good collection ?. 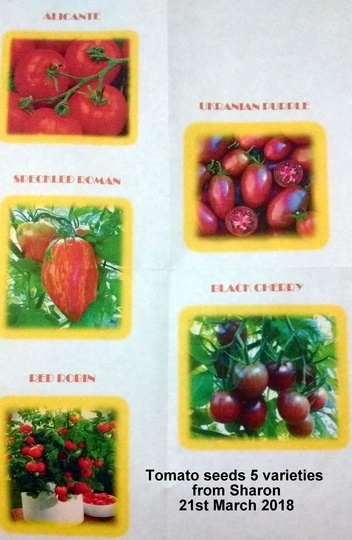 I bought some "Crimson Crush" tomato seeds to try. It is supposed to be blight resistant which mine got last year. Thank you all for reading my latest blog ? 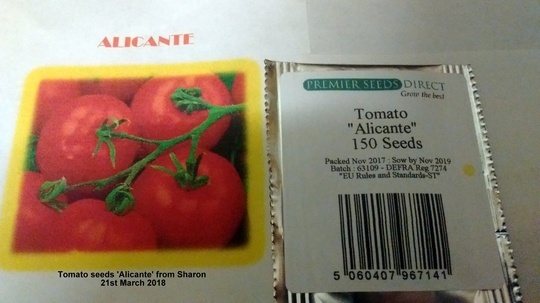 Hywel, send me a PM with your address & I will put some 'Alicante' seeds in an envelope & send you them. They are almost foolproof & give tomatoes of a similar size to the ones you can buy in the supermarkets. Don't be fooled by the Spanish name as they grow extremely well in the British climate. I grew them here on the allotment I shared with my friend Gerry. Jen above mentions Blight, a disease which kills potatoes & Tomatoes. Unlike 'Crimson Crush' this variety is not resistant, unfortunately. ? But if you can grow them under cover & so keep the leaves dry you shouldn't have any problems. The tomatoes I grow on the balcony never get Blight because the leaves never get wet. You will need a heated propagator or a warm windowsill to get them to germinate & for the first couple of weeks, then acclimatize them to the outdoor temps & they will grow with very little trouble. Sorry to hear about Tomatoes causing you Arthritis pain, Diane. ? I had no idea they could produce that sort of pain. I know some people find them indigestive but I have never found that. I often eat tomatoes straight from the plants & cherry tomatoes, like 'Gardener's Delight', (which I really love!) are as irresistible to me as sweets to a kid! I found that some years ago when I grew 'Gardener's Delight' that some seeds could survive the winder & germinate & grow the following year! Love that variegated tomato will look for that one! I grew some from an actual tomato last year a cherry one they did very well! You mean the 'Speckled Roman' one, Sewingkilla? It's a Roman type, that is it is plum shaped & mostly used for sauce rather than salads. I have never grown anything like it before! Nor either of the black ones. 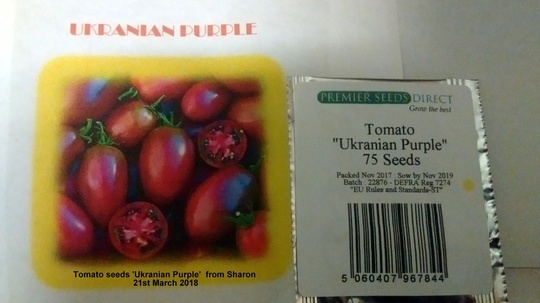 I've only ever grown the traditional red ones except for one year when I collected some yellow cherry tomato seeds from the plants Gerry grew in his greenhouse on his allotment. They did quite well for me! I sowed the 5 varieties the same day & now 4 have germinated but the 'Black Cherry' shows no sign of germinating at the present moment! The Peppers I mention in my blog have been in the heated propagator for several weeks, they don't show any signs of germinating either! BTW, the Tomato seeds weren't put in the propagator, not even on a warm,sunny windowsill & yet they have germinated in about a week! This is the first time I've germinated tomato seeds outside a heated propagator! ? It wasn't intentional either! I was waiting for the Peppers to germinate so I could use it for the tomatoes but they have germinated in days. Perhaps the Pepper seed isn't viable any longer, it was supposed to have been sown by the end of 2016! Balcony, I hope you will not be prevented from growing things on your balcony in the future. This is something that seems to be happening since the " Grenfell Tower" fire & people are very upset about it, which is understandable if that is their only bit of land, so to speak. I would not be happy if it was me! Feverfew, I'm rather confused as to what you mean. Nobody prevents me from growing things on our balcony. I've been growing plants on it for the past 16 years & have had no trouble.Our housing association has never told me I can't grow things on the balcony. You may have seen how the balcony looks from the photos I've posted from time to time,there's hardly a square inch that doesn't have something growing on it, even the walls & up to the ceiling! ?